The holidays are coming and I've already been planning. I ordered my girl's dresses for the personalized holiday cards and parties about a month ago and I've already been planning for what this year's cards will look like. Every detail has to be planned from the presents to the cards to the wrapping paper. I love an elegant but traditional look. I go to great lengths in finding products that fit me as a person as well as our family. When I start thinking about our cards, I try to go to the extra level of not just selecting an ordinary card rather something to treasure or a pre-gift. Mom Bloggers Club announced a fun new giveaway from PurpleTrail for their personalized holiday cards. PurpleTrail is having an exciting new giveaway on sharing five ways you make your holiday cards unique. This is a great way to learn about other great ideas that other bloggers do to create that special card for the holidays. I can't wait to see what others do. Here are some of the ways I make our cards special and I try to expand each year to change them up and make them a little different. I include a traditional photo of the girls all pretty in their matching dresses. 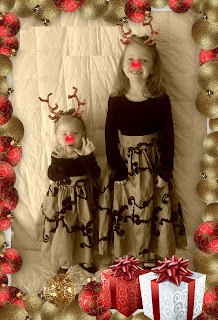 I also include a fun photo such as a photoshop of adding reindeer antlers on them. This year, I have a new grand baby so the photo experience will be even more memorable. With PurpleTrail, I can even send cards electronically and add cool effects like snowfall, music and voice recordings. This will allow me to have the girls since a Christmas carol which will make it more memorable for those with internet access. This is perfect for my husband who is stationed in Kuwait and my dear friend in Australia. I order custom stamps for the addresses with a cute Christmas saying and our mailing information along with personalized postage stamps. The choices for stamps are amazing and they really can jazz up an envelope. The girls and I make a photo ornament the we include in the card. There are very inexpensive ways to make crafty items like ornaments. It's also a fun project for kids to participate in knowing they created a little holiday magic themselves. We hand write the closing to keep it personal instead of pre-printed. Another great choice with PurpleTrails is utilizing the back of the card for more items. 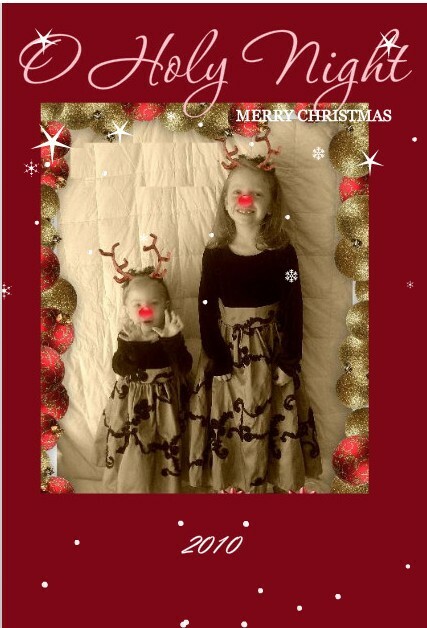 Whether it's another picture or a cute Christmas saying, the cards can be made to reflect your family. This is my example card I created and it looked gorgeous online due to the snow fall effect. Every aspect of the card can be personalized and there are many other special effects that can be added. These cards will stand out as being unique and special. To me, making Christmas special in every aspect is the fun part of Christmas. Being able to personalize and add that extra bit of effort shows my loved ones that I really do care. It was fun creating my PurpleTrail Christmas card and now I'm heading back to have more fun and see what else I can do!